“our” response to Islamic terrorism in more recent years. 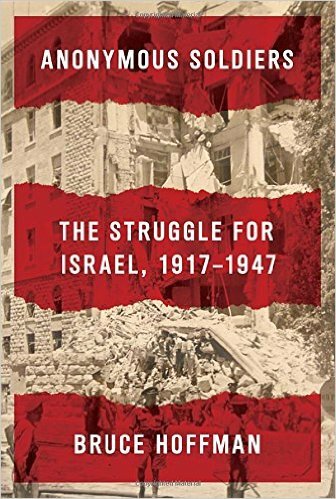 There are also obvious differences but this post is taking a look at the similarities that struck me on reading Anonymous Soldiers: The Struggle for Israel, 1917-1947 by Bruce Hoffman. The Irgun’s terrorism campaign in fact is critical to understanding the evolution and development of contemporary terrorism. The group effectively directed its message to audiences far beyond the immediate geographic locus of its struggle — in New York and Washington and Paris and Moscow as much as in London and Jerusalem. This taught a powerful lesson to similarly aggrieved peoples elsewhere, who now saw in terrorism an effective means of transforming hitherto local conflicts into international issues. Less than a decade later, the leader of the anti-British guerrilla campaign in Cyprus, General George Grivas, adopted an identical strategy. . . . the parallels between the two are unmistakable. The internationalization of Palestinian Arab terrorism that occurred in the 1960s and 1970s would also appear to owe something to the quest for international attention and recognition that the Irgun’s own terrorist campaign . . . .
And the Brazilian revolutionary theorist Carlos Marighella’s famous Minimanual of the Urban Guerrilla, which was essential reading for the various left-wing terrorist organizations that arose both in Latin America and in Western Europe during the 1960s and 1970s, embodies Begin’s strategy . . . . Thus the foundations were laid for the transformation of terrorism in the late 1960s from a primarily localized phenomenon into the security problem of global proportions that it remains today. Indeed, when U.S. military forces invaded Afghanistan in 2001, they found a copy of Begin’s seminal work, The Revolt, along with other books about the Jewish terrorist struggle, in the well-stocked library that al-Qaeda maintained at one of its training facilities in that country. International monitoring bodies like the Red Cross and problematic access to these remote prisons. . . .